Update: The Source Code for Halo Stats for TouchPad is now available here. 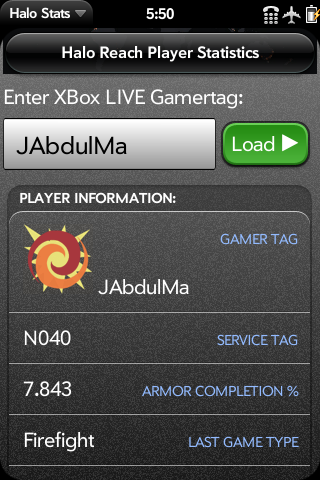 Look up information on any Halo Reach player using Halo Stats. This program is available for both Palm Pre phones and the HP TouchPad. The TouchPad version has a new interface but otherwise provides the same information. Because of HP discontinuing the TouchPad and nearly discontinuing webOS, there are no new features planned for Halo Stats at this time. I will provide updates for problems brought to my attention. Picture of your Spartan – Currently, the image of a generic spartan loads. This is a known issue on Bungie’s end, and custom images will be rolled out sometime soon. Unless the API is changed, the new customized images should appear in Halo Stats automatically. Please contact QNS@John-am.com with any questions! Hi, I was wondering if this will still be available even with Bungie has discontinued stats for Reach. Will you be using 343i’s stats to update this. Love this app, btw. I use it everyday.